Want to use your pool year-round? One way to accomplish that is to cover it with a greenhouse. A greenhouse is also good to enclose a hot tub. The greenhouse pool enclosure is ideal because of the built in solar powered roof vents which allow steam and water vapor to escape during the warmer months. These roof vents can also be disabled and operated manually in the colder months, allowing you to keep the greenhouse more energy efficient. What’s better…glass or polycarbonate? Most people like the look of glass as it is see-through, while polycarbonate is more opaque in nature. Polycarbonate does a better job at keeping the greenhouse pool enclosure warmer in the winter and cooler in the summer. One great alternative is to build a combination greenhouse, using clear tempered glass on the greenhouse side walls and construct the greenhouse roof with durable polycarbonate. As you know, heat rises, and most heat loss is through the greenhouse roof. Constructing the greenhouse roof with polycarbonate helps to reduce heat loss. The greenhouse pool enclosure also allows you to store plants over the winter. Imagine lining your pool with tropical palm trees year round. Be sure to allow at least a 3 foot walkway around the perimeter of your pool, and most people add a patio area of at least 12 feet at either end of the pool (usually the front gable end closes to the house). Many greenhouse companies, like Backyard Greenhouses, offer standard sizes that will easily enclose a pool, or they also offer custom sizes. The greenhouse pool enclosure can be a free standing unit in your backyard, or you can also opt to have the greenhouse pool enclosure attach directly to your home. 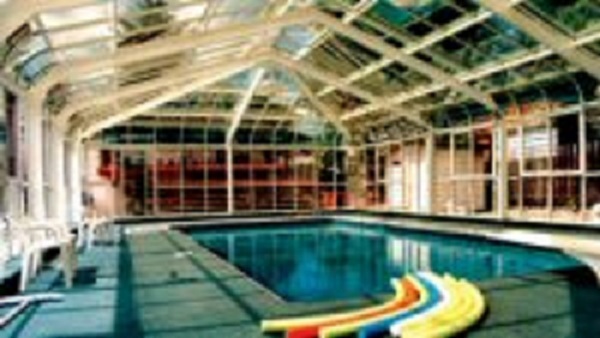 The greenhouse pool enclosure is especially important for those people who use a pool for therapeutic reasons. It is very convenient to step into your backyard and use your own pool during colder months.